“Running Blind” to Premiere at Mountainfilm in Telluride! EJ Scott’s quest to run 12 marathons in 2012 may have ended on December 31, 2012, but he is still working hard to raise money for the choroideremia Research Foundation. His running of 12 marathons in 2012 truly was a real feat and it’s been documented by Ryan Suffern in a 30 minute film that will premiere at the Telluride Film Festival on May 25, 2013. We’re very excited to announce that “Running Blind” will be making its world premiere this Memorial Day Weekend at the Mountainfilm in Telluride, CO. Both EJ and Ryan Suffern, the Director will be on hand for the two screenings scheduled for the weekend (check back for times & theaters), along with Mike Parry (cinematographer) and Ashley Jay (production coordinator). Last year, Ryan attended Mountainfilm with two documentaries playing at the festival that he’d edited; Right To Play, directed by Frank Marshall for ESPN Films’ acclaimed “30 for 30″ series, and Bidder 70, the tale of Tim DeChristopher’s defiant act of civil disobedience, directed by Beth and George Gage. As it turned out, the films ended up being voted the top two favorites for the Audience Award, with Right To Play taking home the prize. Bidder 70 was also awarded the Moving Mountains Award. Needless to say, it’ll be a somewhat difficult act to follow, but Ryan’s thrilled nonetheless to be coming back to his favorite film festival. 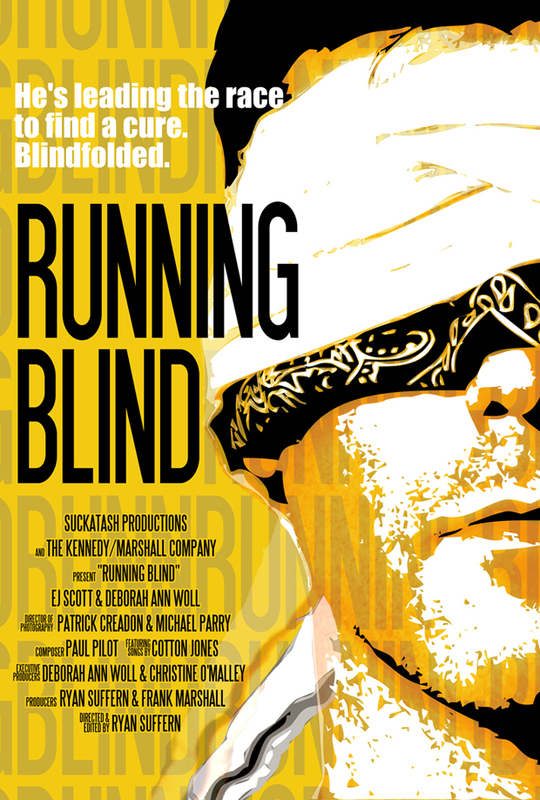 “Running Blind” is the story of EJ Scott, who set out to run 12 marathons in 12 states in 2012 for charity, and he did them all blindfolded! EJ suffers from Choroideremia, a hereditary retinal-degenerative disease that causes blindness, and several years ago, EJ was diagnosed as legally blind. There are nearly 6,000 people in the United States who have Choroideremia. In EJ’s family alone, his grandfather, brother and two young nephews have the disease, and his mother and sister are carriers of it. Despite this incredible genetic misfortune, EJ has responded with a positive spirit, and he’s now doing everything in his power to help raise awareness and funding for a treatment or possible cure. EJ set a lofty goal of raising $12,000 for each race with all of the proceeds benefiting the Choroideremia Research foundation. EJ is the first to admit that he could have never taken on this challenge without the love and support of his girlfriend, Deborah Ann Woll, most known for her portrayal of Jessica Hamby on HBO’s “True Blood.” Having originally met online in 2007, the threat of impending blindness has always loomed over EJ and Deborah’s relationship, and yet, this perceived disability has only strengthened their love for one another. EJ’s journey while running these marathons across the country is an inspiring tale of strength overcoming adversity, and it’s ultimately a reminder that one person can indeed make a difference, no matter the cause.